We did our usual song and dance: buckle up, ask the kids what they learned, pretend we’re going home, end up at Chipotle. 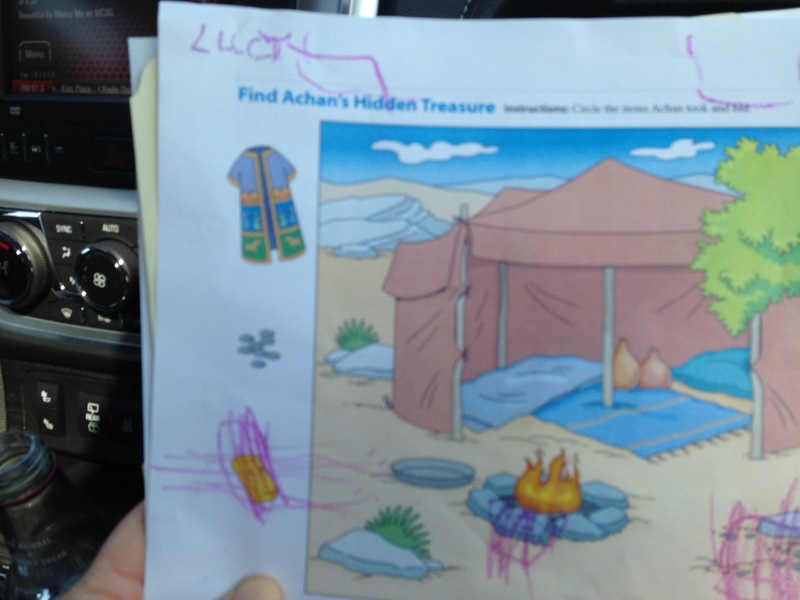 I sit in the front and shuffle through the papers the girls have worked on, trying to glean some prompts for Lucy, while the boys do boy things, loudly, in the backseat. She brought home this, colored and name attempted across the top. The story of Achan, who stole from God and then paid dearly for it, as we always do when we steal from God. That yellow thing on the bottom left side is a gold bar. I asked her what Achan stole. A robe, some coins and a sponge. This then, is how rumors start. And it’s got me thinking of other things that are lost in translation. Like this morning when she introduced herself as Allison and asked me to play Bible study with her. The work I do here is Kingdom work I think. This opening up of doors and welcoming in and praying together and stretching. Kingdom work. But how to get our families to understand that Church is not what happens inside a building but outside of it? How to help them grasp that studying the Bible is a modern concept, that it has replaced following a Rabbi around the city while he ministers and teaches, that perhaps the best way to study the Bible is to put it down and go out and serve? How to grasp that myself? This struck me yesterday when Tess was home sick and I was held hostage in American Girl land for most of the morning. Struck me when Kit and Gracie decided to move to another city (do you have any idea how long it takes an 18 inch doll to walk from one end of the house to the other?) and found there a lavish party with ice cream sundaes and little plastic potato chips. What would it look like if the work of the Kingdom was so intwined with the play of our lives that the dollies set up a food pantry instead of a tea party? If the forts the kids built in the woods were actually soup kitchens and if their knee-jerk reaction to the panhandlers at Target was, pull over-our brother needs us? This, then, is the challenge I’m setting for myself and asking you along for: to live the Bible, the Mission, the Kingdom in such a way that it can’t be separated from our daily lives. To live so that Kingdom work is not just scheduled for Monday morning or Wednesday nights or just before major holidays, but at all times and in all ways. To raise children who walk around with their hands open to receive and to give, to bless. To learn that myself. And when I stand outside the Small’s play and hear Kit and Kanani adopting an orphan and having a luncheon with a widow well, then I guess I’ll know we’re getting closer. Because we’ve gotten away from the mission of Church. Far far away, I think. And Father is calling us back. Calling me back (remember the porch?) and I’m going. Because faith lived out with children will, I have to believe this, give birth to faith lived out later on. So, if we commit to teaching our Smalls, yours and mine, the real purpose of the Church: to love, heal, bless, care, then the Church of the future looks a whole lot closer to the Church of the past and that makes my heart smile. Yours? This is me being real. Too busy being outside soaking up vitamin D to blog. To wrapped up in smelling the sweet perfume of sunscreen on Small skin to do much else than get dirty and sweaty and happy. Too tired from raising four Smalls and 26 Cutie Pies and a Keloid scar named Steve to do anything other than fall into bed at night. What’s keeping you these days?